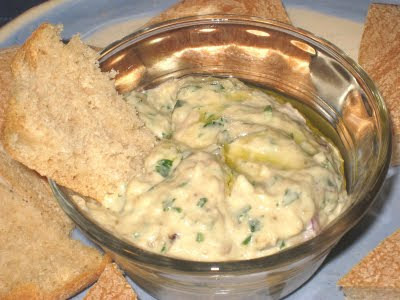 It was with a bit of a shock that I realized I haven't yet posted a recipe for Baba Ghanouj. It was even more of a shock to realize that I haven't made it since I started this blog. It's one of the first middle eastern dishes I ever made, even before hummus. I have had the recipe for so long that I no longer remember from where it came. I think I got it after I moved to Chicago because I'm pretty sure I'd never tasted it until I got here, but I'm not really even sure of that. I know that the first time I tried it I fell in love with that first rush of rich smoky mashed roasted eggplant and tahini followed by the fresh sharp zing of lemon and parsley. It was a regular in my rotation for a while. I don't remember when it fell out of the loop. Last week Treasure Island had eggplant on sale for 69 cents a pound, fresh-picked and huge. I grabbed one with the thought of more Mediterranean-style Pork and Eggplant sauce, but with the cooler weather we've been having my thoughts turned to the oven, and I decided to roast it instead. I have been looking at recipes for making pita lately, so it was an easy step from the roasted eggplant to baba ghanouj with pita bread. So yes, the bread you see in the photo above is homemade, by moi. It came out soft and full of flavor and was the perfect dipping vehicle. My only quibble is that it didn't rise enough to separate, but that's partly my fault. I don't think I got the oven hot enough, and I peeked while they were baking, something I found out later you're not supposed to do - it lets the steam escape, and that's what causes the bread to split. I'll work on that and report my progress. If you don't feel like making your own pita bread, no worries. You can find it in just about any grocery store these days. But you should definitely make this dip. Once you start eating it, it is impossible to stop. Cut stem ends off eggplants, prick with fork, and cook on oven rack in 350' oven 3o to 45 minutes, or until the skin has caved in (check after half an hour). The eggplant tastes better roasted in the oven, but during the hot months of summer you can cut the eggplants in half, place them cut-side down on a plate, partially cover them with plastic wrap and cook them in the microwave at 5-minute intervals, until the insides are completely soft. Scoop insides out of the eggplants into a large bowl, mash them, and combine with all other ingredients except olive oil. Chill. Drizzle olive oil on top before serving. About your question regarding soaking of brown rice, yes soaking helps to cook it faster and I would soak it even to cook it on stove top. Also I have heard, soaking the brown rice softens its outer shell a little making it easier for the body to assimilate the benefits of brown rice.